Millions of sufferers could finally find relief. We’re often asked by doctors to rate our pain on a scale of 1 to 10. Maybe if you had a headache that wasn’t too bad — more annoying than anything — you’d say a 2 or 3. If you’d shattered your leg in a car accident, it might hurt so much that you couldn’t even think or speak clearly enough to communicate the level of pain. When presented with any kind of measurement scale, most of us will fall somewhere in between — but what happens when you find yourself stuck at one end of the spectrum? As scientists have set out to understand and treatment pain, they’ve given a lot of consideration to two conditions that, while rare, are the best examples we have for those extremes. The first, congenital insensitivity to pain, is when a person feels no pain, even if they are terribly injured or ill, even if their life is threatened. They may, at times, feel discomfort, or like something is a bit “off,” but they don’t experience the sensation of pain like the rest of us do. On the other end of the spectrum are disorders of chronic — even constant — pain, one of which is called erythromelalgia. That disease causes a person to feel a near-constant, burning, hot pain in their arms and legs. Their skin can even be discolored and warm to the touch. After decades of research, scientists finally have a lead on what could cause the body to turn the “volume knob” on pain up or down in such a way: the SCN9A gene. 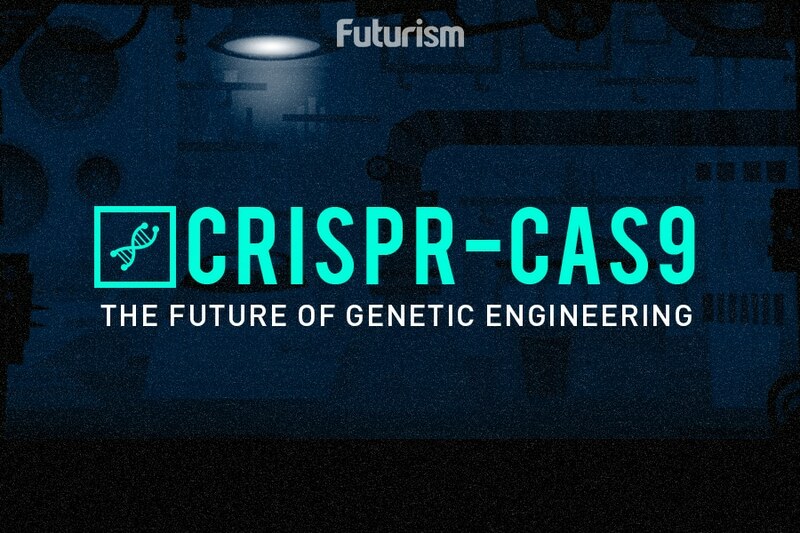 In people with no mutations of this gene, stimuli is detected by nociceptors, receptors that run from our spinal cord to our skin. A message is then sent through our central nervous system to our brain, and our brain decides if that stimuli is painful. Pain is a way to warn our body of danger — potential injury from a hot fire, for example — so if our brain determines that something is painful, it sends a message to another part of the body, like the muscles of the arm, for instance. That message tells our muscles to flee from whatever the stimuli is — in this example, maybe our hand jerks away from the open flame of a campfire when we get too close. In the middle of all that signal swapping are sodium ion channels that allow (or don’t allow) those messages to get through. One of those channels, NAv1.7, is encoded by the SCN9A gene. The pervading theory is that mutations in that gene can warp the sodium ion channel’s function. In one mutation, the “gates” don’t open, the signals can’t pass through, and the person can’t feel pain. In another, those gates open and allow signals to go through when they don’t have to, making any stimulus, not just something that would normally cause pain, feel painful. 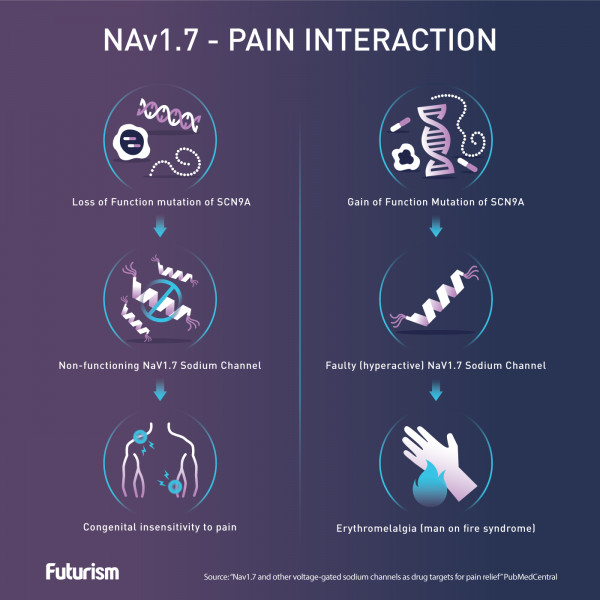 Knowing this, researchers are now hoping that they can tap into what is — or isn’t — happening in NAv1.7 to develop treatments or even cures not just for the “extremes” of pain, but other conditions that cause chronic pain, such as diabetes, nerve damage, or arthritis. According to the National Institutes of Health (NIH), more than 25 million Americans are living with some form of chronic pain every single day, and that pain has led many to develop addictions to prescription painkillers — 2 million people, in fact. When those don’t provide enough relief, some sufferers even turn to illegal drugs like heroin to manage their pain. In that respect, this research on SCN9A and NAv1.7 could not only change the lives of those living with chronic pain, it could go a long way toward ending the opioid epidemic currently plaguing the nation and improving society as a whole.